Or in this case, blog. Things are really calm in our house right now. There’s no big crisis. Mental health services are in place & other services are coming into place as planned. Classes are going ok–more than ok for our Davey! And my weekend away was just what I needed to be recharged and ready for another busy week. B gets next weekend off, and he is being called more and more for engineering jobs—signs that he’s rocking the jobs he’s doing. But, Brian and I are still grieving the loss of several friendships and the changing of others. I think it’s totally normal & appropriate, but, just like with other loss, there’s no handbook. We were discussing my blog posts and my FB post… He was a little concerned that the wrong people would take it personally. But, it was *all* personal! It was my feelings and emotions. It was days and days of tears being poured out into words. And I can’t say that I am sorry. I have loads of friends who haven’t said a word about what’s going on with my boys… I know tons of people who have seen us hurting. And, there have been several who have really been there. There are women I can text and know that they will understand. And I am so grateful for that! Those friendships will last a lifetime. But, there are those who have just taken a step back. Some because of fear, some because they don’t know what to say, some because they are just wrapped up in their own stuff. And that is ok. There’s no need for guilt for that… I totally get not knowing the right thing to do or say.. I understand that this stuff can be scary. (I don’t know what do to or say and it often scares the crap out of me!!) But, I guess my feelings are a good reminder. A reminder for me, especially! A reminder that people have so many burdens. A reminder that being a friend means just letting people know you are there. A reminder that I have friends who want to be there, but I just haven’t opened up to the right people at the right time. A reminder that there are so many, many struggles! A reminder that sometimes other people really, really need you–even if they don’t say. 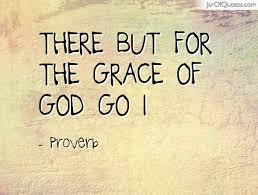 The song, “But for the grace of God go I” is still a refrain that is sticking. The song is a love story, but, to me, it’s a reminder that despite the bad days, there are so many good ones! A reminder that I have my kiddos to hug and hold. A reminder that there is progress, if not perfection. A reminder that it could be so, so much worse. I hope that this finds you at peace. I hope it reminds you that you are loved. I hope it reminds you that I am here if you need someone. I hope that it may bring you hope if hope is what you need. Here, I am feeling some hope… Hope that was missing for some time. And I am feeling loved. And I am working on feeling at peace.